This is Amanda Norris back with the newest document discovered in the Arnold Family Papers (MS-599). I am a graduate student in the Wright State University Public History program and completing my capstone project with SC&A. Today I wanted to focus on the Civil War Draft notice and subsequent exemption that I discovered. These documents belonged to my Great-Great-Grandfather Joseph Decker, who lived in the small German Catholic community of Minster, Ohio. This town in Auglaize County sits along what once was the thriving Miami and Erie Canal. Joseph Decker (December 10, 1836 – July 31, 1896) married into one of the founding families of Minster, the Steineman Family. He supported his first wife Mary Catherine (1843-September 12, 1884) by working as a cooper, or barrel maker, and shipping along the Canal. 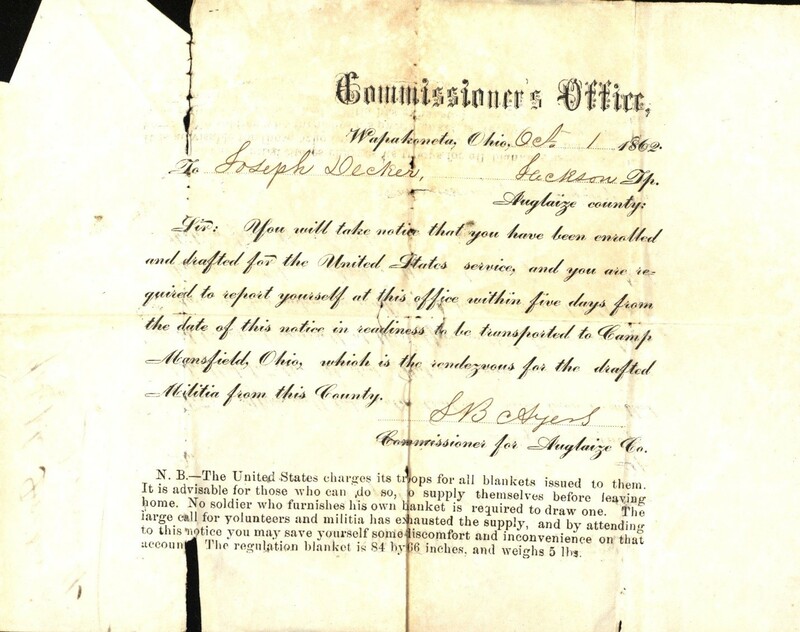 In 1862, Joseph Decker received a draft notice from the United States Army to report to the Commissioner’s Office in Wapakoneta on October 1st. The draft notice states at the bottom that each draftee is ordered to bring their own blanket. 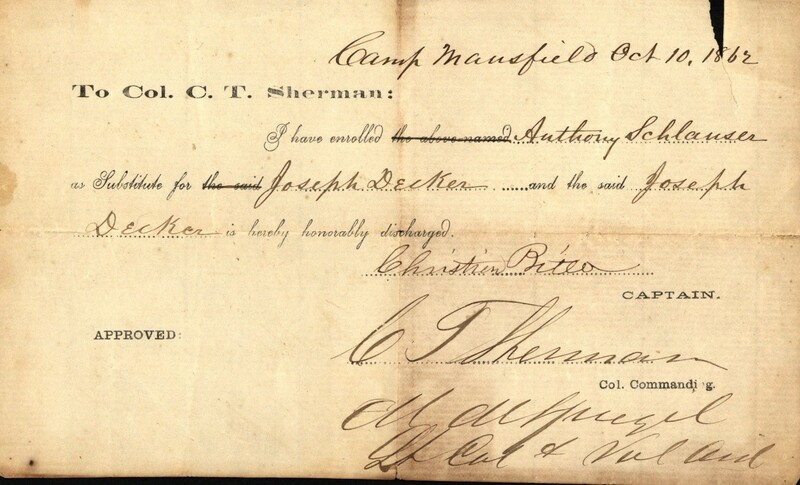 Just a few days later Joseph Decker received an exemption from service in the War. While it is unknown if Joseph Decker hired a replacement, which was a popular alternative for those who could afford such a luxury, or if his position in the shipping industry in Minster was important to the war effort. Regardless another man, Anthony Schlauser, was sent to the war in his place. Whatever the reason, Joseph Decker remained at home in Minster, Ohio, where he buried his first wife in 1884 and married his second wife, Mary Meyer Decker (January 24, 1862-April 3, 1941), who gave him his only child Marie Decker, born on March 8th 1896, mere months before his own death. Thanks for reading and stay tuned for future updates! This entry was posted in Civil War, Collections, Local History and tagged Amanda Norris, Arnold Family, MS-599, Student Capstone. Bookmark the permalink.